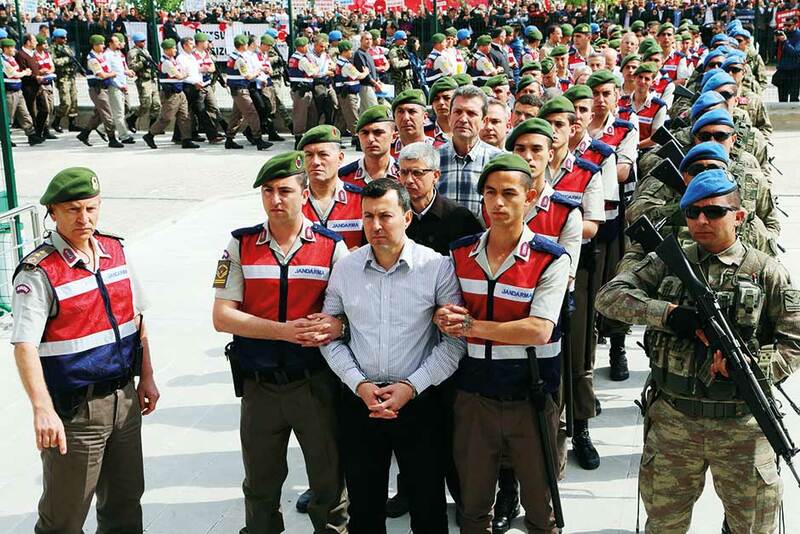 Sincan, Turkey: The trial opened on Monday of more than 220 suspects, including over two dozen former Turkish generals, accused of being among the ringleaders of the attempted coup last year aimed at ousting President Recep Tayyip Erdogan. Turkey blames the attempted July 15 putsch on the US-based Muslim cleric Fethullah Gulen, a claim he strongly denies. But Gulen is one of the 221 suspects named in the indictment. Gulen — who lives in self-imposed exile in the United States — is among nine of the 221 suspects who remain on the run with the remainder appearing in court. The suspects were paraded into the courtroom inside a prison complex in Sincan outside Ankara by security forces in front of television cameras, AFP correspondents said. Several dozen protesters holding Turkish flags booed at the suspects, shouting “we want the death penalty” with placards saying: “For the martyrs and veterans of July 15, we want the death penalty”. Twenty-six generals are among the charged suspects, including former air force chief Akin Ozturk and Mehmet Disli, the brother of senior ruling party lawmaker Saban Disli. Also on trial is colonel Ali Yazici, Erdogan’s former military aide. The case is being heard in Turkey’s largest courtroom, which was purpose-built to hear coup-related trials and has space for 1,558 people. There was heavy security in place, with a drone flying overhead and armoured security vehicles on site, an AFP correspondent said. Several of those on trial are accused of leading the “Peace At Home Council”, the name the coup plotters are said to have given themselves on the night of the failed overthrow. The charges against them include “using coercion and violence in an attempt to overthrow” the parliament and the Turkish government, “martyring 250 citizens” and “attempting to kill 2,735 citizens”, Hurriyet daily reported on Sunday. The trial is one of many being held across the country to judge the coup suspects in what is the biggest legal process of Turkey’s modern history. The vast Sincan courtroom has already hosted in February the opening of the trial of 330 suspects accused of murder or attempted murder on the night of July 15. More than 47,000 have been arrested on suspicion of links to the Gulen movement in an unprecedented crackdown under a state of emergency that was imposed in the wake of the coup.